Disclaimer: I am not a medical professional. I am not a trained donor coordinator. I am simply a mom who has gone through the process of searching for a bone marrow donor twice. I am sure each donor center does things a little differently. I am simply documenting the process we went through, at Texas Children's, and with the National Bone Marrow Registry when searching for Kate and Will's donors. This week is all about finding a donor! While the actual treatment phases are when a transplant patients life is saved, this step, the act of finding a match, is quite possibly the most important step of the entire bone marrow transplant journey. Without a match, a transplant cannot be done. A life cannot be saved. A family cannot continue as the family unit they know and love. I'm going to break this process up into four sections - HLA typing, what goes on with the patient while searching for a donor, what goes on with the donor as they are screened as a possible match, and the decision. Obviously I do not have personal experience with donating marrow so any information regarding what happens on the donor's end is what was explained to us as we sat and waited to hear if either of our kids had a match. Human Leukocyte Antigen typing is what is used to match bone marrow transplant recipients and donors. According to the National Marrow Donor Program (NMDP), "HLA are proteins - or markers - found on most cells in your body. Your immune system uses these markers to recognize which cells belong in your body and which do not." There are multiple HLA "match points" and the more points a recipient and donor match on, the better. The closer the match, the higher the chance the patients body will accept the donor cells because the body "recognizes" the markers present in the donor cells. Every individual has HLA markers present in their body. Half of these markers are inherited from your biological mother, the other half inherited from your biological father. Because HLA markers are inherited, there is a 25% chance that a full biological sibling of the patient will be an HLA match to donate marrow. Parents and extended relatives have a small chance of matching patients. While the NMDP sets a minimum threshold of 8 match points, most donor centers look at HLA matching on a 10 match point level. I am not a scientist and will not even begin to explain these 8 or 10 points. If you are interested in reading a great overview of this, feel free to visit the NMDP page about HLA typing (link). I'm sure many of you are asking "Why is HLA matching so important"? 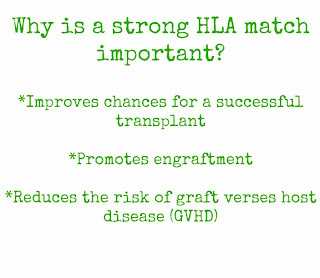 There are several reasons why a good HLA match is such an integral part of a successful bone marrow transplant. 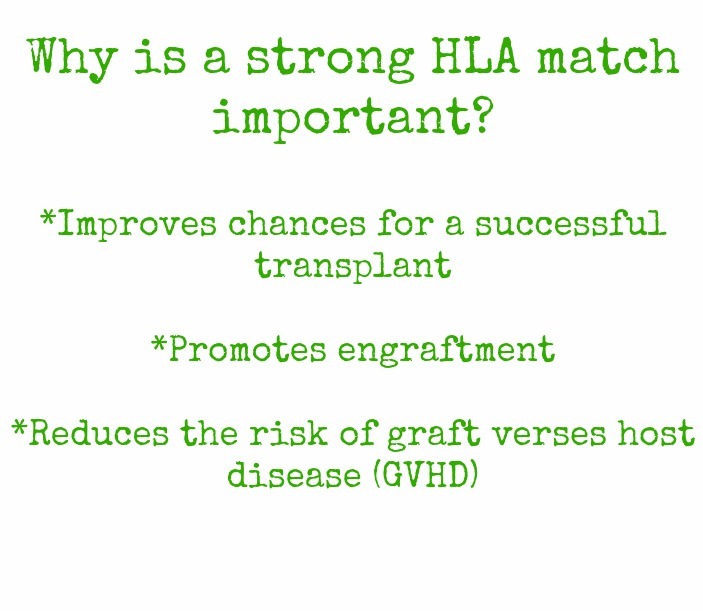 There are three main reasons why a strong HLA match is so important. A successful transplant means the patients body accepts the donor cells. As I mentioned above, the more match points the patient and donor have, the more likely their body is to think the donor cells belong. The remaining two points, engraftment and GVHD, all relate to a successful transplant but these things happen after the patient receives the donor cells. I will be discussing them in more details in the next few weeks! Today we are just talking about finding a donor! There are other factors to consider when selecting a donor (viral status - CMV and EBV are a few looked at - age, health, blood type) but these factor are simply "extras". HLA is the most important factor when finding a match. Now that y'all understand the basis of matching a patient and a donor, we can talk about what happens on each end as a match is made! As soon as a bone marrow transplant is deemed necessary, the patient is HLA typed. At the same time parents and siblings are typed as well. The typing process can take up to three weeks for various reasons. We learned how long the typing process can take when we were waiting on Kate's typing to come back. I blogged about my frustrations regarding this in June 2011! As stated above, the chance of a parent matching is extremely slim. However, there is a decent chance siblings will match. If a sibling is identified as a good HLA match, the patient moves to the next phase of the BMT process, prepping for transplant/ conditioning. However, 70% of transplant patients do not have a familial donor and have to reach out to the national and International marrow donor programs to find their life saving match. As soon as we discovered Alex and I were not matches for either of our children, we started working with a transplant coordinator to find a donor. An initial pass is made against the national and international registries. Side note: When people join the registry, they are not fully typed. It is extremely expensive to conduct a full HLA typing so several major HLA markers are used to register donors. A pool of potential donors is identified, and ranked. The top pool of donors (typically no more than 6 at a time) are "activated" as potential donors and contacted for additional testing. As soon as this happens, the patient, and their family, is left to wait for a donor to be identified. This can take several months. After a donor joins the NMDP (I will talk all about joining the registry in a few weeks), they are placed in a database for all potential donors. A donor can sit on the registry for 15+ years before being contacted as a potential donor, they may never be contacted, or they could get "the call" a month after joining. There is simply no way of knowing when one might be called as a potential match. When a donor is identified as a potential donor (as I mentioned above), they will be contacted via phone, email, or letter (proof that it is SO important for donors to keep their contact information up to date). At this time it will be determined if a donor is still eligible, and willing, to donate. If they meet the criteria, potential donors will need to have additional blood work done. This blood work is the detailed HLA typing as well as other viral/ infectious disease blood work. After a donor goes in for additional testing, it could be 4-6 weeks before they hear anything. This is due to the fact that the patients doctors want all potential donor testing in (remember up to 6 donors can be "activated" for one patient) before selecting a donor. As soon as all testing is back, the patients team of doctors will meet and make the official decision regarding a donor. If none of the potential donors are acceptable matches, this process will continue with donors on the registry until a pool of potential matches is identified. As soon as all potential donor lab work is back, the patients team of doctors will round table to discuss all matches. A perfect match is the best case scenario but if no perfect matches are identified, other donors will be considered and possibly selected. If multiple "10 out of 10" matches are identified, things such as CMV status, age, etc will be considered. For whatever reason, younger donors tend to be more "proven" so a younger donor (20s) will always be preferred over an older donor (40s+). When we were searching for a donor for Kate, we ended up with 3 perfect HLA matches. This was incredible and allowed Kate's doctors to find a young (24 at the time of donation) CMV negative (Kate is CMV negative) donor. It was much harder to find a match for Will but thankfully we ended up with one perfect donor! Will is CMV positive which made his donor CMV status unimportant. It is best to not expose a CMV negative patient to someone that is CMV positive. Once a potential donor is named as the official donor, they are contacted and must agree to donate. If they agree, the donor will begin the next round of testing which includes a physical and additional lab work. If everything checks out, the individual is ready to donate marrow or peripheral cells. Y'all will hear all about donating (as of now I have a peripheral cell donor lined up to guest post) in a few weeks! Next week we will talk about the conditioning phase - or what happens as a patients body is prepped for receiving their life saving cells! As always, if you have any questions about the process of finding a donor, shot me an email and I will get back to you as quickly as life with two kids allows! Thank you for your very thorough explanation. What happens when families do not have health insurance? Are their medical expenses covered or are their lives less important to save? Very interesting to know. I've thought about getting swabbed before, and this made me wonder more about viral status. I know that I've tested positive for both EBV and CMV before. Does these mean I would not be a good donor? Jennifer- being CMV/EBV positive is not a negative thing at all! Most people are positive for both viruses! The biggest thing is that it is best if CMV negative patients do not receive CMV positive marrow. But, like I said, most patients are already CMV positive so this is not a valid point. I know you said the donation post is coming and I'm anxious to read more about that. I'm curious as to what the donor goes through and how physically strenuous it is on their body. Do they have to take time off work? Is there a time required to heal? I wonder if FMLA would cover the donor if they worked? Also, how does insurance work? Does the donor's insurance pay for medical costs? Does the recipient's insurance pick up if the donor does not cover the whole or partial cost?